It is just about March, and the true sign of Spring appeared on my doorstep a few days ago. It was The West Coast Seeds catalogue (yes, I know I do not live on the west coast, but they offer organic seed varieties, and it is "local" or as local as I can find.) So with the first signs of Spring, it is time to start planning this year's garden and that is what I will share with you today. The Garden Plan. Our one baby radish. His brothers and sisters did not survive the wormies. As we learn, each year we have managed to grow some food, and last year we managed to grow enough food to enjoy tomatoes, spinach, onions, potatoes, beans, and carrots, well in to the Fall. And because I know you want to know, the list of the failed crops from last year included beets, broccoli, brussel sprouts, and radishes. Well, the radishes were not a total flop, we did get one gem. So this year when I decided what seeds to order, I was sure to keep in mind which seeds failed last year and why. As you can see, the carrot harvest was a bunch of baby carrots. Yes, baby carrots. Beans - TBD - a pole bean though. They are easier to pick and so pretty. Potatoes - Cam got some off kijiji from a local farmer whose family has been growing these potatoes for a hundred years. SOLD. And in Vavenby, Cam is going to plant a small garden by the river. We hoping that the water table is high there and we can have a garden without having to water it. So for that garden, we will plant beets, onions, and yams (as advised by my best friend the botanist and pro gardener). And maybe a pumpkin. Wouldn't that be neat to grow pumpkins. Of course we'll have to fence it off, but I think it will be fun to try. It would be great to figure out optimal planting locations for different types of plants on the property given its varied terrain. I have drawn up a plan of where we will plant everything in our Northern Alberta garden. I first did it in pencil since it is like a game of Jenga trying to get everything to fit. And I also had to keep in mind other things like soil quality, companion plants, amount of sunlight, heat from buildings, and crop rotation. It will also probably change once we start planting, but every good plan is paved with good intentions. Front yard garden plan. A regular Monet. I am nervous about the quality of the soil in the front garden beds, so top priority items go in the back, with duplicate items or different varieties of a seeds planted in the less desirable dirt in the front. In the front yard we have two 4'x8' and two 4'x16' raised beds. The soil here is basically clay, so next year we will turn in leaves and add as much compost as we can get our hands on. In the backyard, the soil quality is exceptional. We have heard stories that the original owners had an amazing garden there at one time, and it shows. Things grow like weeds in this soil, including the weeds! But learning to keep weeds at bay has only made me a better gardener. We also have a long garden bed by the garage, where the tomatoes did well last year. The backyard garden plan with wide rows and companion plants in some rows to maximize the harvest. On the right, we plant flowers in that row since it gets swampy. As I said before, gardening in Northern Alberta is our practice ground so we can know exactly what we are doing when we move down to Vavenby. So now is the time to make mistakes and learn from them. To take the good from the bad, we shall call these mistakes "lessons". Soil quality shall not be taken for granted. Not adding any soil amendments to our planter boxes made for soil that did not retain any moisture and was nutrient deficient. This year, many a soil amendment will be added. They look so tiny when they are first starting out. Space things out. Respect your plants' need for space. I planted a 'sprinkling' of tomato seeds in a tray and just left them to grow. When it came time to transplant them, they were all tangled up and so I planted them all together. When they grew up into four foot plants, they were falling all over each other and blocking the sun from one another, and it was a mess. This year, they shall each be started in their own pot so they can be transplanted easily outdoors, away from their seedling neighbours. Support from the get go. Upgrading from small supports, which seem large in comparison to a tiny starter plant, later in the season is tricky and awkward. This year I will plant large supports, that will suit the needs of the full grown plant, on the first day I transplant the baby plant outside. Ants. I haven't figured this one out yet. But I do plan on finding an organic way to keep ants out of my planter boxes. One box is giant colony and killed two tomato plants last year. Not good. Look at the baby cuke. So innocent. It didn't even see the frost coming. Starting seeds indoors. The growing season just is not long enough for some plants where we live, and I need to give some plants a head start. My cucumbers were just starting to form last summer, and bam, the frost got them. So the lesson is to start all varieties that do not need to be sown outdoors directly, indoors, as early as possible. The secret second crop. No one ever really talks about the second crop. Until I read The Good Life by Helen and Scott Nearing, I did not realize its potential. They preach that gardeners are not maximizing their crop potential if they only plant one crop. After my peas had fallen over, and my spinach bolted, I could have planted another quick crop like mustard greens or kale (kale is said to get better after a frost or two) in their place, but instead the garden looked naked after I ripped out those plants. Never again. If you squint your eyes, you can see a tiny beet on top. Yep, that was about it. Just a handful of tiny beets. Don't be afraid to thin seedlings. I did not have the courage to kill those tiny baby plants when they popped up last year. They were so new, and cute, and I could not do it. And do you know what that meant? Yeah, small harvest. The smallest actually. The carrots were bad enough, but out of a whole bed of beets, I only got a dozen beets that were no bigger than a twoonie. So this year I will be ruthless. The seedlings will be thinned and the crop will be bountiful. 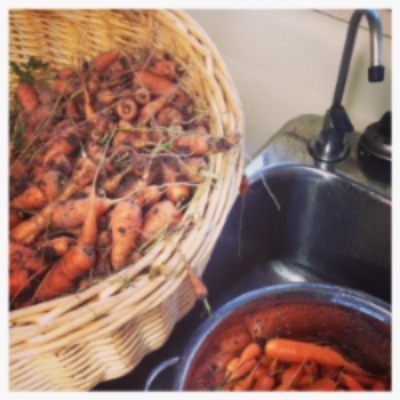 So I am hoping that having learned from these lessons will make for a record breaking harvest this summer with colourful carrots and beautiful beets. Each year likes to have its added twist, but given this will be our third year at this location, I think we will have many of the obvious foibles ironed out. I am excited to get out there and get my hands dirty. I remember reading somewhere that we absorb minerals by getting our hands dirty in the garden (assuming lead is not present - eek-gawd.) Soon the seeds will arrive and I can start to put these lessons into practice. Until then, I will enjoy this winter wonderland with some good ol' cross country skiing while I still can. Please do not use this information as advice. Until I can confidently know how to grow everything successfully, you are better off to ask someone with more experience than me. Ask anyone else really. Have you ordered your seeds yet? Any special gem on the list?